This book, Let Not Your Heart Be Troubled , was published and released by Crossway Books earlier in the summer. It was released on the tails of the death of my brother-in-law, Landon (car accident), and my dad (cancer). Life seemed a bit overwhelming. Some days were worse than others. Some moments still feel outrageously unbearable even when I know that they are. If I replay my dad's final moments in my mind, I cry. I try NOT to think about the end but sometimes it creeps in. Every time I pass Landon's picture that is in our house, I smile a sad smile inside. I miss them both....especially because we're about to add to our family in a way that both Dad and Landon were INCREDIBLY excited about and in support of! I'm sure there will be many moments in life when we miss them terribly and wish they were here. But they cannot be. I opened this book not really knowing what to expect. I should introduce it to you as it was introduced to me upon opening the book. This book is actually comprised of sermons given by Martyn Lloyd-Jones who was a minister of Westminster Chapel in London. He gave this series of sermons in the years immediately following World War II, when London itself was in shambles and people were 1. generally nervous about the future and 2. grieving the loss of many loved ones (not to mention 3. grieving the loss of a way of life that existed prior to the war). Lloyd-Jones was speaking to a broken people, all of whom had common afflictions, and individual ones. It was not an easy time, historically speaking. The messages this minister gave to his congregation were very fitting then, as they are now towards anyone who is grieving. The point Martyn Lloyd-Jones is trying to make to his congregation, and any reader, is that the only way to have a peaceful heart that is truly at rest is to believe in God, to believe in His goodness, to believe in the things He told us about Himself and the things He promised to do. In many ways, this book is a compilation of sermons that walk you through the Gospels, offering the salvation message. That is the core of Lloyd-Jones message. The thing I appreciated is that he says that to be a Christian does not mean to walk a life of ease. It does not mean that we get to call the shots as to what happens. We have to believe that God, who gave HIS OWN SON up to death on the cross (Rom. 8:32), certainly is not asking too much of us by removing loved ones from our presence. In fact, He says that when we make a decision to follow Christ, we will take up our own cross (Mark 8:34). We will carry a burden (Matt. 11:30), but because He promises never to leave us (Heb. 13:5), that burden will not feel too much. 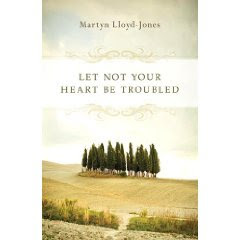 In Let Not Your Heart Be Troubled , Lloyd-Jones points out that the only thing that is certain in life is that we will have to face death. But should that necessarily startle or frighten us? No, it really should not. Will it be unpleasant? Possibly. But we cannot stand before the Throne of Grace and experience the joys of Heaven unless we die. Death is life (as I mentioned yesterday). Death is inevitable, thanks to sin. The only way I can have peace is to say that God is sovereign, God is good, God knows what He is doing and that He does not make mistakes. If I thought Landon died by accident, how truly horrific would life be? If I thought dad died as a result of a series of accidents, I could not live out the rest of my life at peace and at rest. There are no requirements that I instantly understand God. In fact, I may not be able to at all. That's ok. I don't have to know. I only need rest that His promises are sure. I only need believe that He is who He says He is. I don't want to spend my time fighting Him, arguing that He should be and/or think like me. Rather, I should want to be changed BY Him. There is a difference. I have no interest in complaining, because it does me no good. Can I express pain? Yes, I can. I not only can but I must because I'm human and God does have care and concern for my feelings. He does not ignore them or demand that I do so. He created us to be relational so quite naturally it is going to hurt (dreadfully so!) when someone we love dies and we live on. But what is dishonouring and pathetically futile? * Railing at the sky, with fists in the air shouting out curses to God. * Refusing to say that He spoke truth when He said that His plans are good. * Saying He is good but not good enough because I hurt and that's somehow wrong. * Saying I wasn't ready or didn't get what I "needed" out of someone or something other than God. * Saying I knew better. * Saying I won't keep living because I don't like the way things look now. * Saying I hate God. None of the above are good for our soul's health. As Lloyd-Jones argues, the best thing we can do when we face pain is to focus on who God is (who HE says He is and not who we THINK He is). That means "going straight the source" which is the Word of God to determine what God looks like. It is resting in truly knowing HIM. Not knowing figments of our imagination but the true God in all of His great mercy and love. He is God. I am not. I cannot pretend to know what His plan is. I can only know that it is good and in that I rest. In that belief, I have no desire to be shaken. I can hurt. I can cry. But in all of that, I must believe. If I cannot believe that, then I could not want to live. But because I do believe that, I want to live wisely and well, putting my relationship with God before all others so that when it's time for me to meet with death, I can shout out, "WHERE, O DEATH, IS THY VICTORY!?!?!?!?!" (1 Cor. 15:55) (And believe you me, I intend to SCREAM that from the other side.) He has conquered death. I shall not fear. My heart will be quiet and at rest, knowing that Jesus has conquered the grave and wrenched the teeth out of death's mouth, rendering it it's most painful blow by making it completely ineffective. The Lion of Judah has triumphed! (Rev. 5:5) The battle is over and done. His holy right arm is victorious. The lamb of God has won! THAT is why my heart is not troubled and is, in fact, at rest. I've read one of Lloyd-Jones' books before and part of another one. I really enjoy his style. Thank you for the review, Carrie, I'm going to buy this book! Dear Carrie I want you to know that I lost someone very special to me, well the most special person in my life: my mom. She died because cancer: tipycal, isn't it? I really hate this disease. Everything that you mentinoned about it, every little feelling happen to me too. I`m studieng to be a Spanish teacher, and I know that she wont be there when I finish it (the studies). She wont be when I get married either, she wont meet my kids, her grandchildren, and they wont meet her either, and it is very sad, because she was an amazing person, not only because she was my mom, because she really was amazing. This happen three years ago, and if I don't think about it, that moment, I'm happy. Life is a good thing, despite of everything. Did you read Anne of Green Gables, or/and Anne of Avonlea: Anne, the protagonist speaks about her lost, and it is exactly what I feel. Maybe you will like it too. And, Carrie, I will told you something I heard some days or weeks ago: Death is inevitable, yes, but Life is inevitable too; we never think about this matter. We didn't decide to born, but after all we are here, living. So, enjoy it, instead of think about death. And, I don't undertsand God either, but I try every time I start to think about all this. But despite of my trieng, I'm still afraid of death, but I promise I will still trieng harder. Thanks for share this with us, really. I got your point about living life. ANd that is important too. Very much so. I guess what I have lived so far is - life. Death had not previously touched it. It seemed so far off. I like the rose colored glasses approach in saying that everything can and will turn out well. It's easy to praise God for His goodness when everything is going as *I* liked it or I thought *I* had planned it. However, it's a process to learn how to say, "God is SO good" even when things are falling apart. That is the intent of this particular post. It is to say that in all times, and in all circumstances we CAN be at rest, knowing that God is good. I think you are saying the same thing with the very healthy reminder that there is still life to live. Thank you for sharing such a difficult time of your life. The comment from Noelia was so heart warming. I've never lost someone that close to me. Thanks for sharing the book and the trailer from YouTube. Makes one really understand that we are not God and He knows what He is doing and we need to trust.